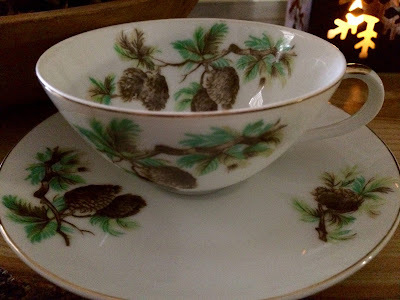 My dear friend, Michele, sent me this pine cone trio set and I have so enjoyed using it. I've shown my pine cone teapot that my sweet sis sent me several years ago. 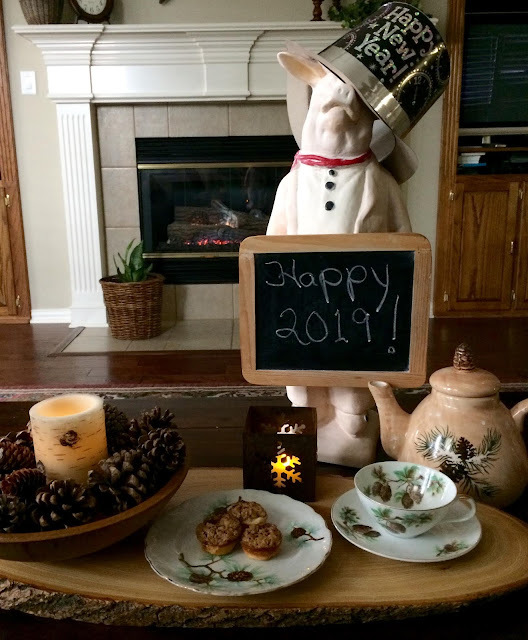 I am having some coconut vanilla tea today, which is from Tea of Life. I have always found beauty in pine cones and have collected them for years, and love using them for decorations. Isn't this teacup so beautiful? Seeing the spray of pine cones inside the cup is an added bonus. 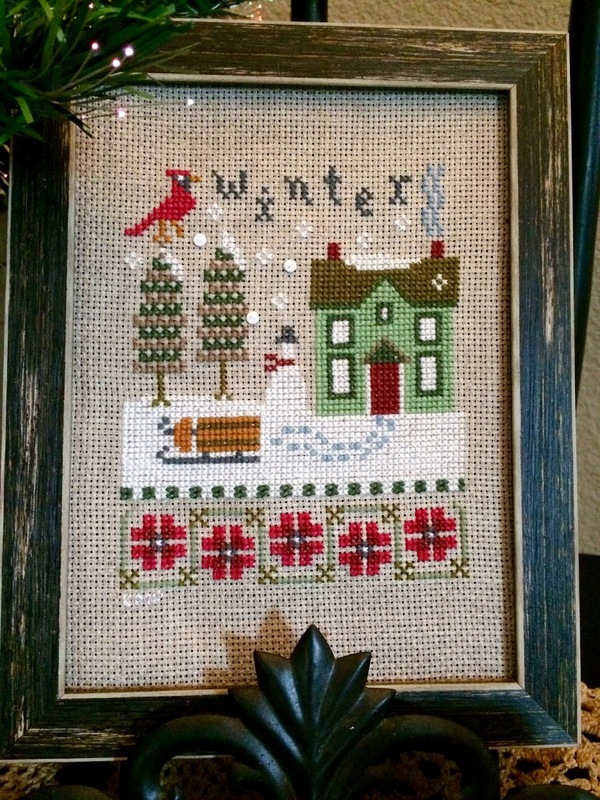 Thank you so much, Michele, for sending this thoughtful gift to me. 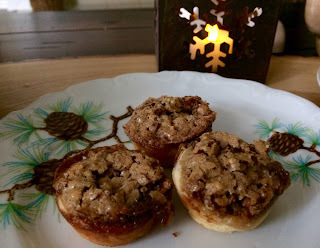 Cissy and I recently made these delightful morsels, which are like mini pecan pies, and are perfect with a cup of tea or coffee. The dough is so easy, and we had fun making them. With an electric mixer, beat the 1/2 cup butter and the cream cheese until smooth. Add the flour and beat until fully combined. Cover the bowl with plastic wrap and chill in the refrigerator for 1 hour. Preheat the oven to 325 degrees F. Spray a 24-cup mini-muffin pan with cooking spray. In a large mixing bowl, whisk together the melted butter, egg, brown sugar, vanilla and salt until smooth. Set aside. Shape the chilled dough into 24 balls, about 1 inch in diameter. Press each ball into a cup of the muffin pan, spreading evenly and up the sides, then spoon 1 teaspoon of the pecans into each muffin cup. Fill each cup with the egg mixture until evenly distributed, about 1 teaspoon in each. Bake until the filling is set, about 25 minutes. Cool on a wire rack for 10 minutes, and then remove from the muffin pan. 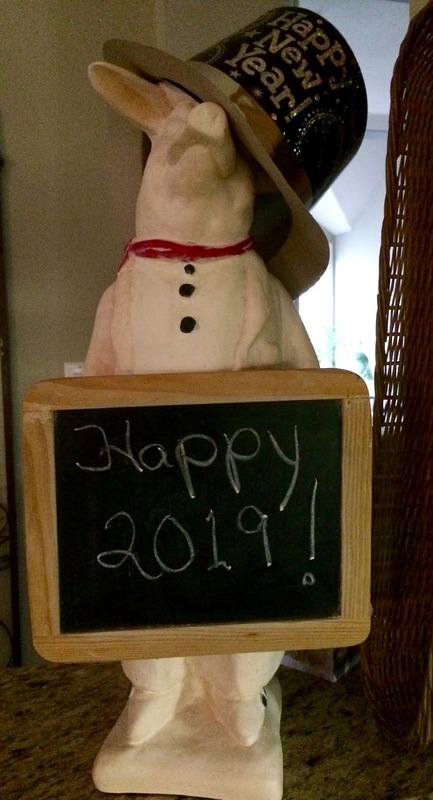 Thank you for your visits throughout the year, and may you have many blessings in 2019! Dishing It and Digging It! 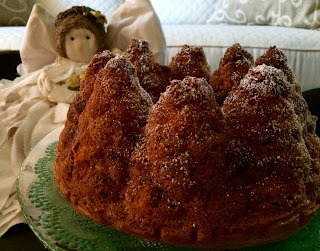 I love when I can use my Holiday Tree Bundt pan! Isn't the tree form pretty for Christmas time? 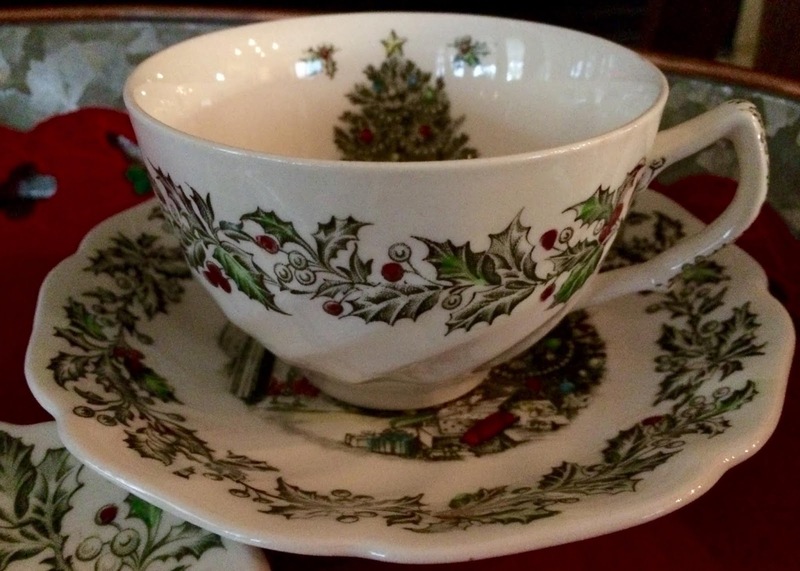 The tea set was one that my youngest son gave me years ago, and it's so pretty sitting on my coffee table. 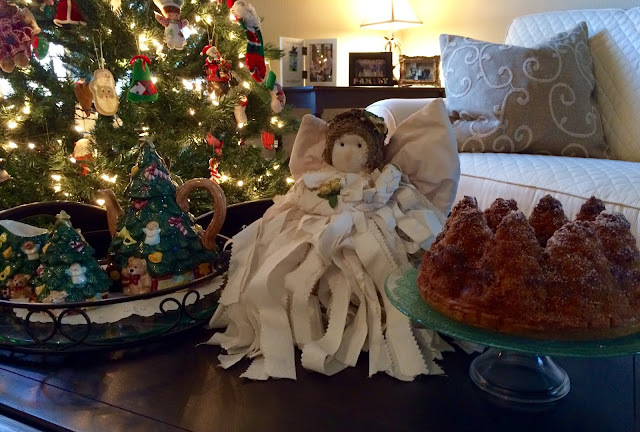 the angel was gifted to me by a friend who passed away five years ago. Reminders of friends always warms my heart. I got this recipe from a friend, and it is so tasty, and perfect for brunch. 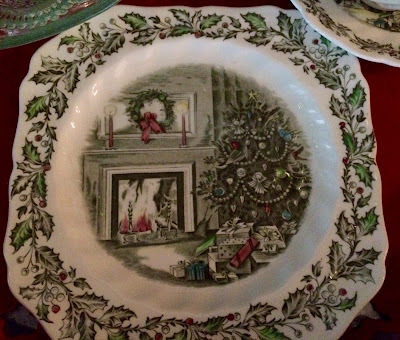 I sprinkled some powdered sugar on to resemble snowfall, but I intend to make the glaze and pour on before serving. Mix all cake ingredients on high speed of mixer for about 5 minutes. Hand Mix in separate bowl the streusel mixture. Spray bundt pan with nonstick cooking spray. I used a spray that had flour in it, such as Baker's Joy. Sprinkle bottom of Bundt pan with 1/4 c. streusel mixture. Pour 1/3 of batter in pan, layer with 1/2 of streusel , then another third of batter, rest of streusel, and final third of batter. Bake 45-55 minutes at 350 degrees. Let cool on a cooling rack for about 10 minutes, and then remove the cake from the pan. Let cool. Mix ingredients for the glaze and pour over the cake. Four year old Harper was in her school's Nativity performance, as a sweet angel. 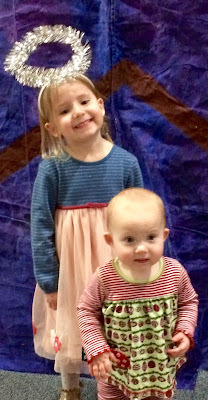 I'm always happy to attend important events in my grandchildren's lives. Merry Christmas to each and everyone of you! May God's grace and blessings surround you during this most special season. 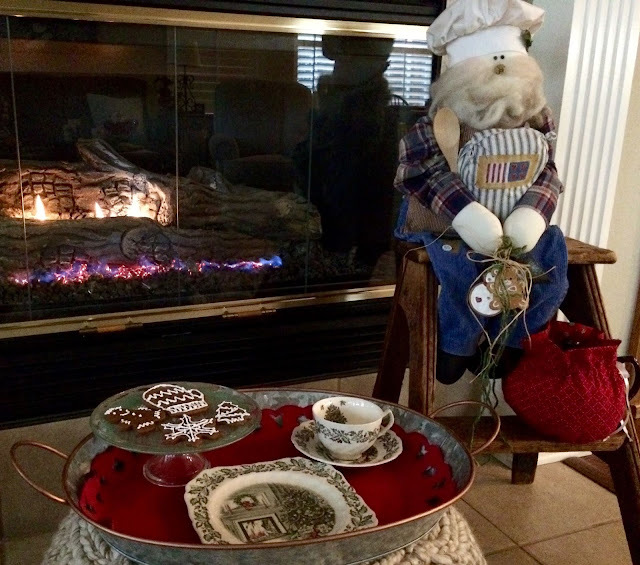 Let's enjoy some gingerbread cookies by the cozy fire today. 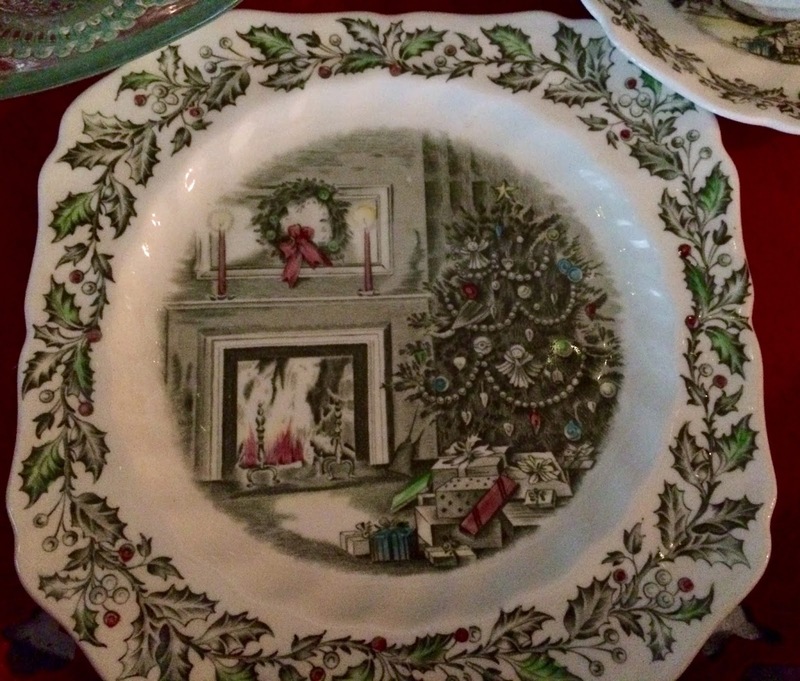 This Johnson Brothers plate with the matching teacup is one of my very favorites! 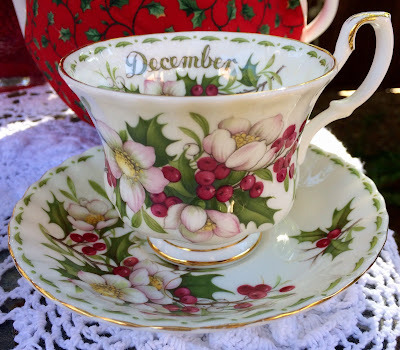 Don't you love the Christmas tree inside the cup? My daughter gave me this Baking Santa years ago. 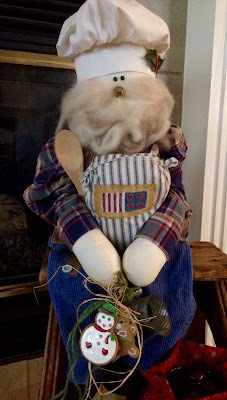 Isn't he sweet with his overalls, flannel shirt, flour sack, wooden spoon, pitcher, and cookies? This sweet girl came to help cut out gingerbread cookies for my grandchildren to decorate for our party. My late beloved and I went to Williamsburg for our honeymoon way back in 1970. While there, we tasted the most delicious gingerbread cookies. I found this recipe and saved it from somewhere that I don't remember now. Preheat oven to 375°F. Combine the sugar, ginger, nutmeg, cinnamon, salt and baking soda in a large mixing bowl. Mix well. Add melted butter, evaporated milk, molasses and vanilla extract. Stir until well combined. Add the flour 1 cup at a time, stirring well after each addition to prevent lumps. The dough should be very smooth and stiff enough to handle without sticking to your fingers. If necessary, add up to 1/2 cup additional flour to prevent sticking . 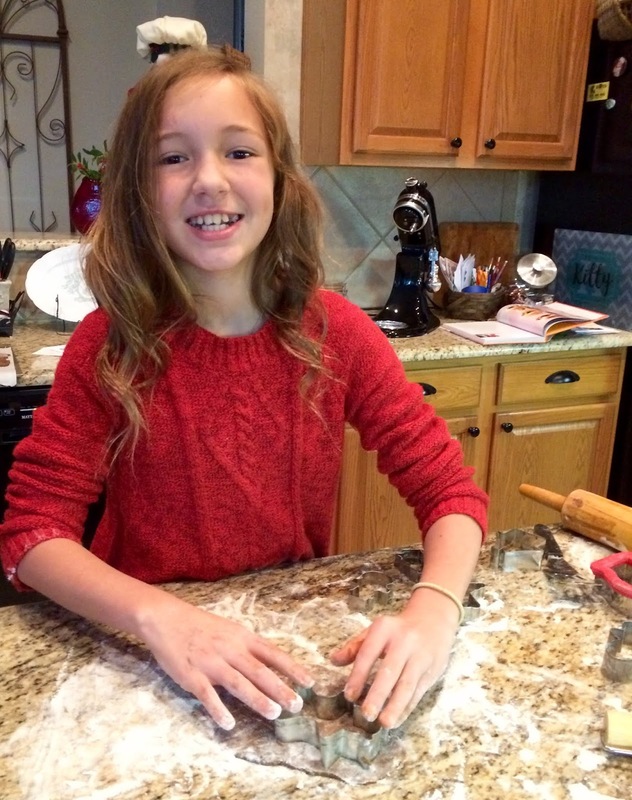 On a well-floured surface, roll out the dough to 1/4-inch thickness. Cut with cookie cutters. It may be necessary to re-flour your surface several times to prevent dough from becoming sticky. Bake on a lightly greased baking sheet, or parchment lined baking sheets, for 10-12 minutes. For small cookies, reduce baking time to 6-7 minutes. The cookies are done if they spring back when touched (but before the edges begin to brown!). Remove cookies immediately from baking sheet and cool on cooling rack. 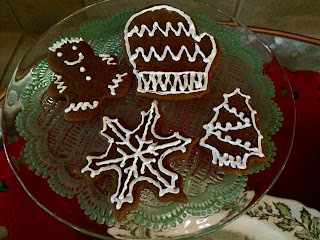 If desired, frost your cookies, or outline them with a royal frosting or a butter cream. Does anyone still use a fiber optic tree? I've had this one for years and years and just love it! My Santa is one that my daughter gave me one year. His appliqued outfit and embroidered mittens are so pretty. 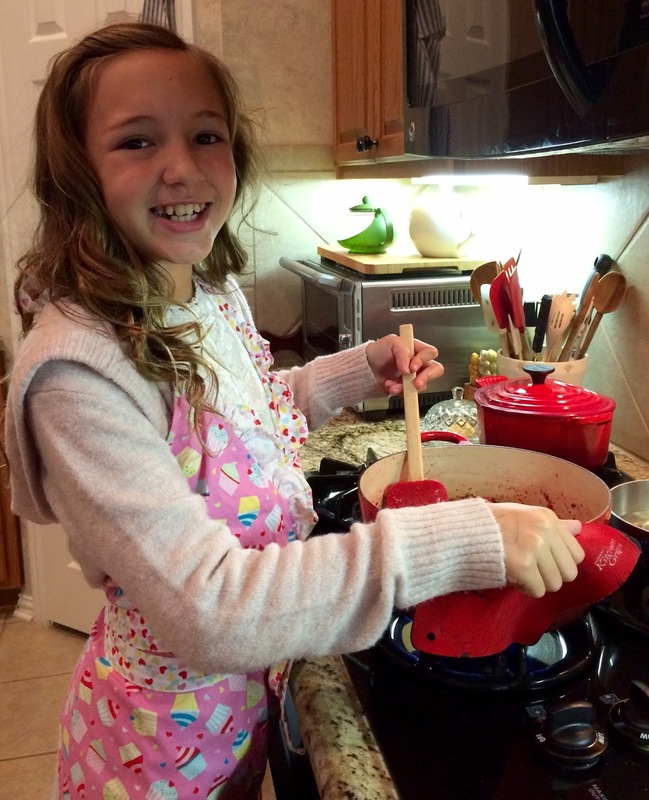 Please join me for some cookies that Cissy and I made. 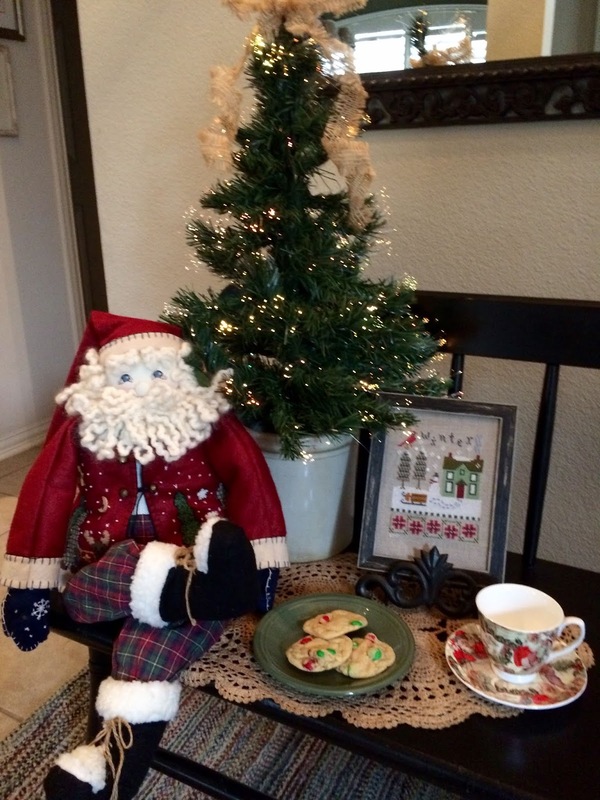 We will be having some Candy Cane Lane tea to go along with the cookies. This is a Gracie bone china teacup that's dishwasher safe. 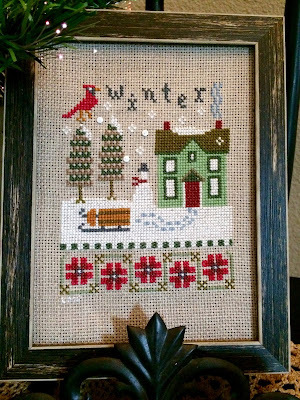 I cross stitched this piece several years ago. 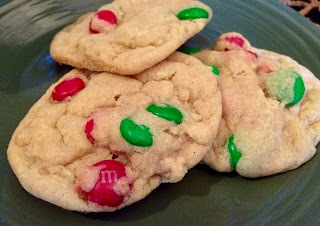 These are soft cookies which would be fun to do for different holidays, using seasonal M&M's. Heat oven to 350°F. In medium bowl, mix flour, baking soda and salt; set aside. In large bowl, beat butter, granulated sugar and brown sugar with electric mixer on medium speed about 1 minute or until fluffy; scrape side of bowl. Beat in dry pudding mix. Beat in eggs, one at a time, just until smooth. Beat in vanilla. On low speed, gradually beat flour mixture into butter mixture until well blended. Stir in chocolate candies and white chips (if using) until blended. Drop dough by rounded tablespoonfuls about 2 inches apart onto ungreased cookie sheets, or parchment lined cookie sheets. Bake 9 to 11 minutes or until light brown. Cool 2 minutes; remove from cookie sheets to cooling rack. Cool completely, about 15 minutes. Store in airtight container at room temperature. 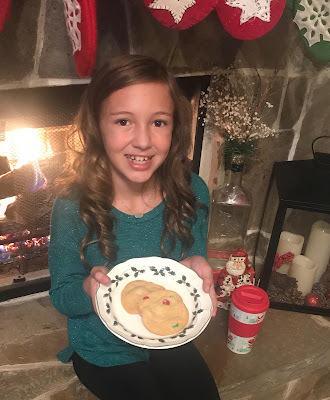 Cissy took home some cookies for her family to have. 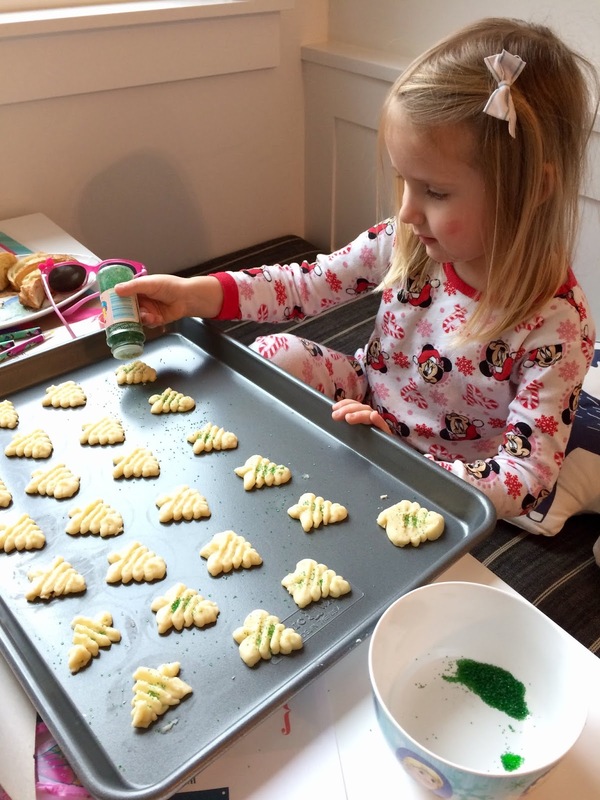 I babysat my two youngest granddaughters overnight this past week , and Harper and I made Shortbread Spritz cookies. She was so gentle in sprinkling the colored sugar onto the cookies. She's her daddy's sous chef, and even helped make homemade pasta with him! 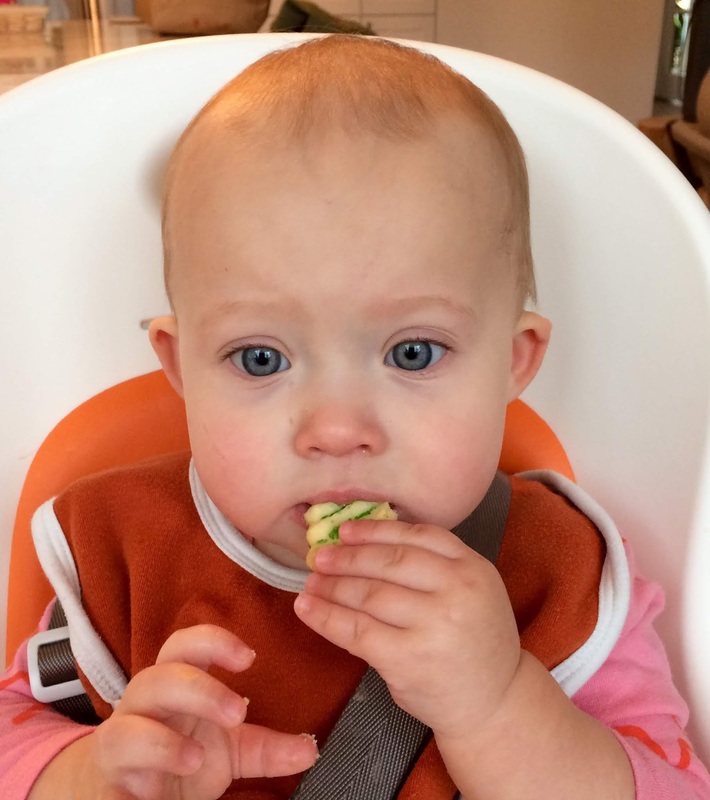 Hayden didn't get to help, but she sure enjoyed munching on a cookie! We really had some beautiful days here in Texas, and I set up our tea outside today. 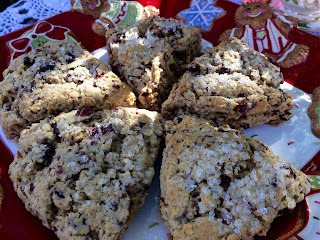 Won't you join me for some Christmas Scones? 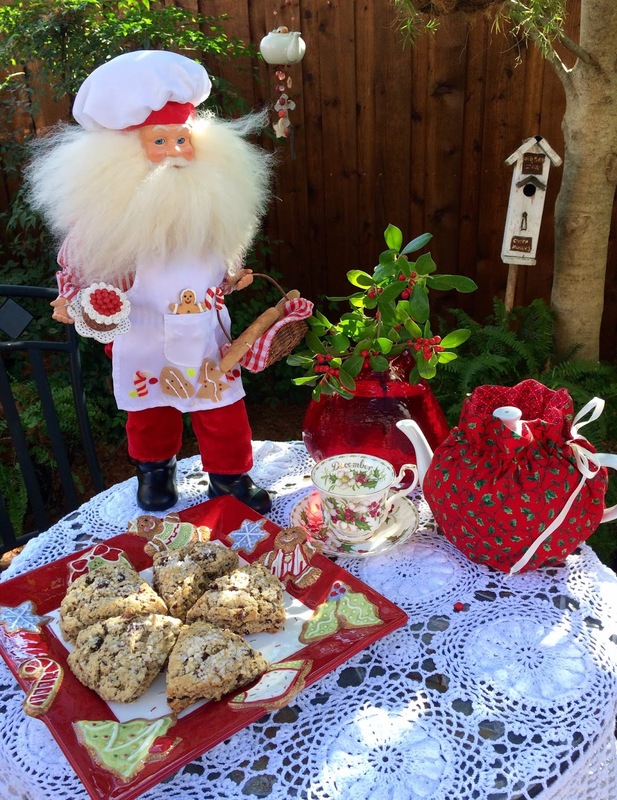 My baking Santa has been busy in the kitchen! The greenery in the vase is from my East Palatka Holly trees, which look so pretty in the Winter and the birds like to feast on the berries. 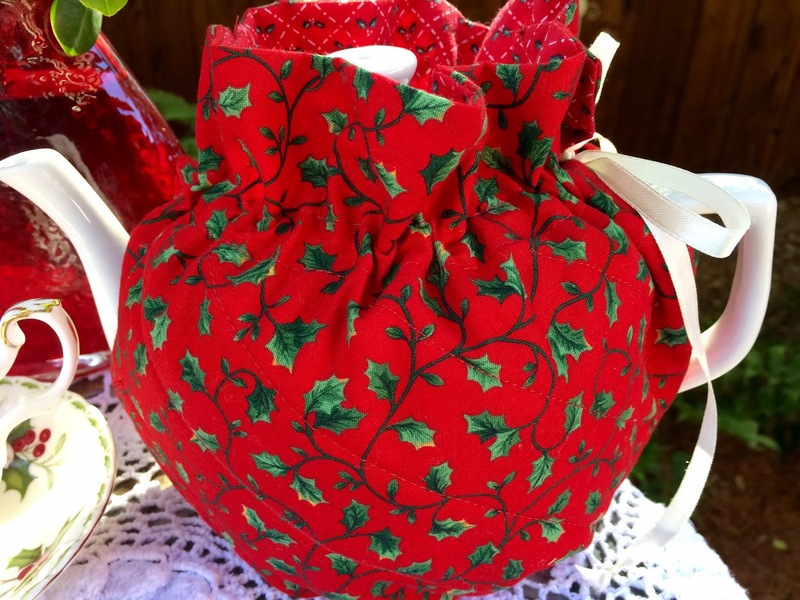 I made this tea cozy, to add some festive cheer to my teapot. 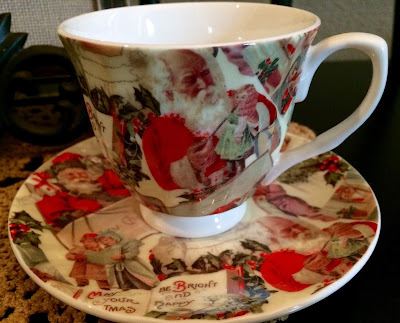 My friend, Rosie, gifted me this Royal Albert teacup from her late mother's collection. 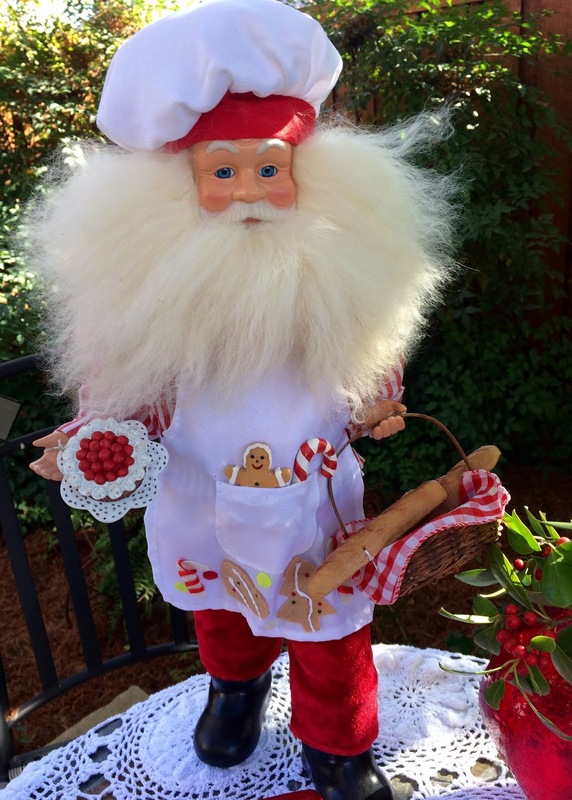 This Santa keeps me company in my Kozy Kitchen! My late hubby and I always made Christmas Jam for years and years to give as gifts. The past five years, I made it by myself, but this year, Cissy helped me, and it was a special time to share with her. You can find the recipe here. I needed to use up some buttermilk and found this wonderful recipe. Preheat the oven to 375°F. Lightly grease a baking sheet, or line it with parchment. Mix the dry ingredients in a large mixing bowl. Add the butter, working it in to make an unevenly crumbly mixture. Add the fruit and nuts, mixing until they're evenly distributed. Stir in the buttermilk. Turn the dough out onto a well-floured surface and cut it into two pieces. (Keep sprinkling on flour if you need to.) Form each into a disk, and gently pat each disk into a round about 6" in diameter. Transfer the disks to the prepared baking sheet, and sprinkle them with sparkling sugar, if desired, pressing it in firmly. With a bench scraper or sharp knife, cut the round into 6 wedges. Do this by cutting straight down through the dough so you shear the edges. Separate the scones slightly; there should be about 1" between them at the outside edge. Repeat with second disk. Bake the scones for 20 minutes, or until they're just beginning to brown. A toothpick inserted into the center of one should come out clean, or perhaps with a few moist crumbs clinging to it. Remove the scones from the oven, and serve them warm. To serve later, reheat for 10 minutes, lightly tented with foil, in a preheated 350°F oven. Store any leftovers at room temperature, well wrapped, for several days. Freeze for longer storage.